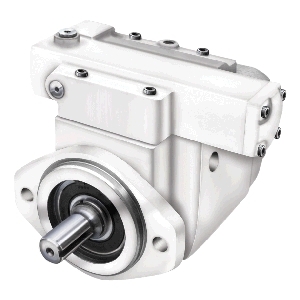 PVWJ open loop, axial piston hydraulic pumps by Oilgear are uniquely designed for enhanced stability and less maintenance in low- to medium horsepower applications. Incorporating static seals (o-rings), the PVWJ family of pumps reduces control noise and features a more aesthetic design. Available in three frame sizes and ten displacements, PVWJ pumps allow for greater flexibility to selectively match pressure and capacity. And, with a variety of optional controls, the PVWJ family of pumps provide easy field interchangeability.